The GROHE Costa sink mixer – versatile style and superior build quality! Beautiful yet timeless design fused with precision German engineering! The GROHE Costa sink mixer looks perfect in any contemporary bathroom and is made from the finest materials to ensure it lasts a lifetime. The tap is also heat insulated and a delight to operate. The tall 360° swivel spout with mousseur is super convenient and can be turned with the lightest touch and the sparkling GROHE StarLight chrome coating is scratch-resistant and very easy to keep clean – just wipe with a dry cloth and it looks shiny and new. 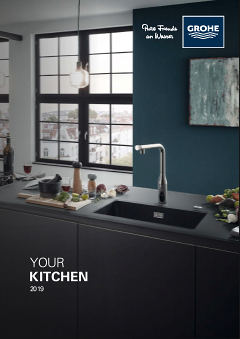 GROHE Costa – a quick kitchen additions that looks fantastic and delivers everyday performance you can rely on!